Download "Guide to Planning and Assessing School-based Special Education Services"
1 Guide to Planning and Assessing School-based Special Education Services GUIDE TO PLANNING AND ASSESSING SCHOOL-BASED SPECIAL EDUCATION SERVICES 1 T his guide is designed to help school improvement teams better understand how to engage in the continuous improvement of the delivery of special education services in their schools. It is organized around the central issues guiding Montgomery County Public Schools (MCPS) in improving special education. 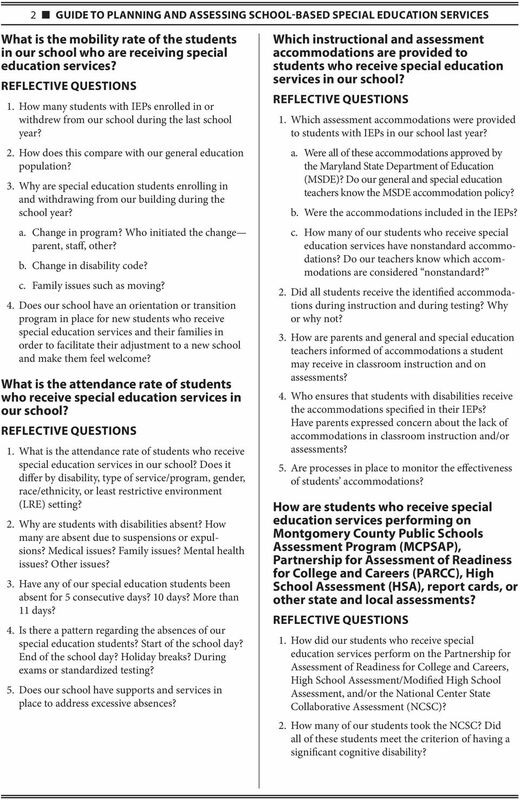 The guide provides specific questions to ask about special education in your school. 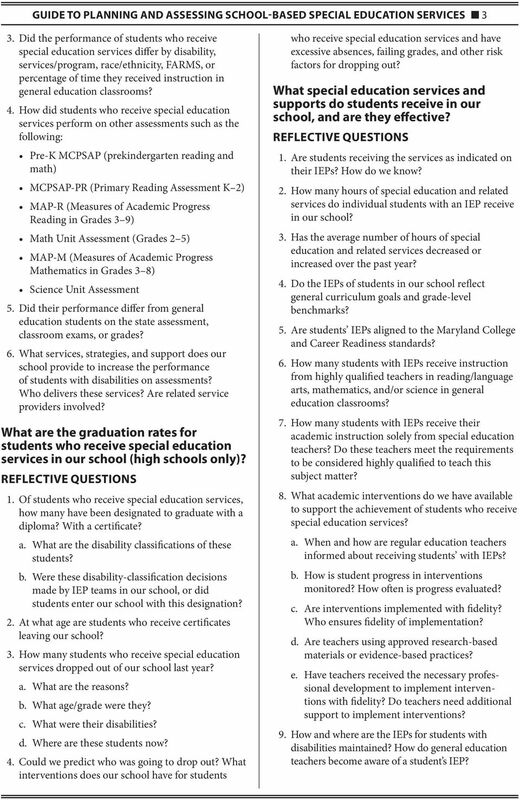 Some of these questions may be answered by the data you will receive in Special Education at a Glance. What are the features of special education programs and services in our building? 1. The following is a list of MCPS special education services. Which services are available in our Autism, Autism Resource Services, Aspergers, Elementary Home School Model, Elementary School-based Learning Center, Deaf and Hard of Hearing Program, Learning and Academic Disabilities, School Community-based, Learning for Independence, Resource, Emotional Disabilities, Physical Disabilities, Vision Services, Speech and Language Services, Transition Services, Elementary Learning Center, Bridge Services, Gifted and Talented/Learning Disabled Services, and Extensions. 2. The following is a list of related services provided to students with Individualized Education Programs (IEPs). Which services are available in our Audiology Services, Counseling Services, Occupational Therapy, Orientation and Mobility, Parent Counseling Services, Physical Therapy, Psychological Services, School Health Services, Specialized Transportation, Speech/Language Therapy, and Vision. Which students receive special education services in our building? 1. How many students with IEPs are there in our a. What is the male:female ratio? b. How many students are past or current Free and Reduced-price Meals System (FARMS) recipients? c. Are any racial/ethnic, socioeconomic status, age, or other subgroups of students disproportionately represented in special education in our d. What are some factors that may have contributed to this disproportionality? e. Are our school s students with disabilities from our attendance area; or do they come from other schools in our cluster, quad cluster, or other clusters in the county? f. Does our school have specific special education services that may result in students coming from outside of our attendance area? Are these students more likely to be from specific racial/ ethnic groups or other subgroups? g. What are their disabilities? h. When were these students identified for special education? Did this occur while they were in our 2. How many students were referred to special education screening in our school during last school year and this school year? a. How many were subsequently found eligible? b. What were the students races/ethnicities? c. How many students are eligible for FARMS? d. What interventions did general education teachers implement before making a referral? e. How were these interventions evaluated in terms of duration, intensity, and effectiveness? f. Do some teachers refer more students to special education than other teachers? g. What data do we have on the effectiveness of the Collaborative Problem Solving process in increasing achievement, reducing referrals to special education screening, and/or reducing problem behaviors? h. How do we ensure that students with disabilities are receiving appropriate accommodations, supplementary aids and services, and support before we resort to behavior interventions? i. If a student requires behavior intervention, does the team consider short-term individualized school counseling, a Functional Behavior Assessment/Behavior Intervention Plan, and coordination with outside agencies? 2 2 GUIDE TO PLANNING AND ASSESSING SCHOOL-BASED SPECIAL EDUCATION SERVICES What is the mobility rate of the students in our school who are receiving special 1. How many students with IEPs enrolled in or withdrew from our school during the last school year? 2. How does this compare with our general education population? 3. Why are special education students enrolling in and withdrawing from our building during the school year? a. Change in program? Who initiated the change parent, staff, other? b. Change in disability code? c. Family issues such as moving? 4. Does our school have an orientation or transition program in place for new students who receive special education services and their families in order to facilitate their adjustment to a new school and make them feel welcome? What is the attendance rate of students who receive special education services in our 1. What is the attendance rate of students who receive special education services in our Does it differ by disability, type of service/program, gender, race/ethnicity, or least restrictive environment (LRE) setting? 2. Why are students with disabilities absent? How many are absent due to suspensions or expulsions? Medical issues? Family issues? Mental health issues? Other issues? 3. Have any of our special education students been absent for 5 consecutive days? 10 days? More than 11 days? 4. Is there a pattern regarding the absences of our special education students? Start of the school day? End of the school day? Holiday breaks? During exams or standardized testing? 5. Does our school have supports and services in place to address excessive absences? Which instructional and assessment accommodations are provided to students who receive special education services in our 1. Which assessment accommodations were provided to students with IEPs in our school last year? a. Were all of these accommodations approved by the Maryland State Department of Education (MSDE)? Do our general and special education teachers know the MSDE accommodation policy? b. Were the accommodations included in the IEPs? c. How many of our students who receive special education services have nonstandard accommodations? Do our teachers know which accommodations are considered nonstandard? 2. Did all students receive the identified accommodations during instruction and during testing? Why or why not? 3. How are parents and general and special education teachers informed of accommodations a student may receive in classroom instruction and on 4. Who ensures that students with disabilities receive the accommodations specified in their IEPs? Have parents expressed concern about the lack of accommodations in classroom instruction and/or 5. Are processes in place to monitor the effectiveness of students accommodations? How are students who receive special education services performing on Montgomery County Public Schools Assessment Program (MCPSAP), Partnership for Assessment of Readiness for College and Careers (PARCC), High School Assessment (HSA), report cards, or other state and local 1. How did our students who receive special education services perform on the Partnership for Assessment of Readiness for College and Careers, High School Assessment/Modified High School Assessment, and/or the National Center State Collaborative Assessment (NCSC)? 2. How many of our students took the NCSC? Did all of these students meet the criterion of having a significant cognitive disability? 3 GUIDE TO PLANNING AND ASSESSING SCHOOL-BASED SPECIAL EDUCATION SERVICES 3 3. Did the performance of students who receive special education services differ by disability, services/program, race/ethnicity, FARMS, or percentage of time they received instruction in general education classrooms? 4. How did students who receive special education services perform on other assessments such as the following: Pre-K MCPSAP (prekindergarten reading and math) MCPSAP-PR (Primary Reading Assessment K 2) MAP-R (Measures of Academic Progress Reading in Grades 3 9) Math Unit Assessment (Grades 2 5) MAP-M (Measures of Academic Progress Mathematics in Grades 3 8) Science Unit Assessment 5. Did their performance differ from general education students on the state assessment, classroom exams, or grades? 6. What services, strategies, and support does our school provide to increase the performance of students with disabilities on Who delivers these services? Are related service providers involved? What are the graduation rates for students who receive special education services in our school (high schools only)? 1. Of students who receive special education services, how many have been designated to graduate with a diploma? With a certificate? a. What are the disability classifications of these students? b. Were these disability-classification decisions made by IEP teams in our school, or did students enter our school with this designation? 2. At what age are students who receive certificates leaving our 3. How many students who receive special education services dropped out of our school last year? a. What are the reasons? b. What age/grade were they? c. What were their disabilities? d. Where are these students now? 4. Could we predict who was going to drop out? What interventions does our school have for students who receive special education services and have excessive absences, failing grades, and other risk factors for dropping out? What special education services and supports do students receive in our school, and are they effective? 1. Are students receiving the services as indicated on their IEPs? How do we know? 2. 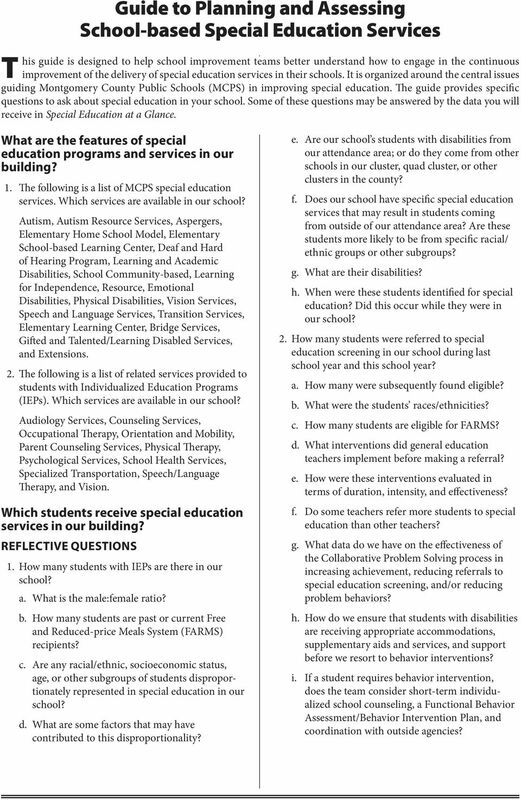 How many hours of special education and related services do individual students with an IEP receive in our 3. Has the average number of hours of special education and related services decreased or increased over the past year? 4. Do the IEPs of students in our school reflect general curriculum goals and grade-level benchmarks? 5. Are students IEPs aligned to the Maryland College and Career Readiness standards? 6. How many students with IEPs receive instruction from highly qualified teachers in reading/language arts, mathematics, and/or science in general education classrooms? 7. How many students with IEPs receive their academic instruction solely from special education teachers? Do these teachers meet the requirements to be considered highly qualified to teach this subject matter? 8. What academic interventions do we have available to support the achievement of students who receive special a. When and how are regular education teachers informed about receiving students with IEPs? b. How is student progress in interventions monitored? How often is progress evaluated? c. Are interventions implemented with fidelity? Who ensures fidelity of implementation? d. Are teachers using approved research-based materials or evidence-based practices? e. Have teachers received the necessary professional development to implement interventions with fidelity? Do teachers need additional support to implement interventions? 9. How and where are the IEPs for students with disabilities maintained? How do general education teachers become aware of a student s IEP? 4 4 GUIDE TO PLANNING AND ASSESSING SCHOOL-BASED SPECIAL EDUCATION SERVICES 10. How is progress toward IEP goals measured and documented, and how is this information transmitted to parents? 11. How do we ensure that IEP services are provided as specified? 12. Do students who receive special education services participate in extracurricular activities? How does their participation compare with the participation of students in the general population? How many receive transportation services? Do parents know the process for requesting after-school activity bus transportation? What supports are available to permit students who receive special education services to access extracurricular activities? Where are students who receive special education services being educated? 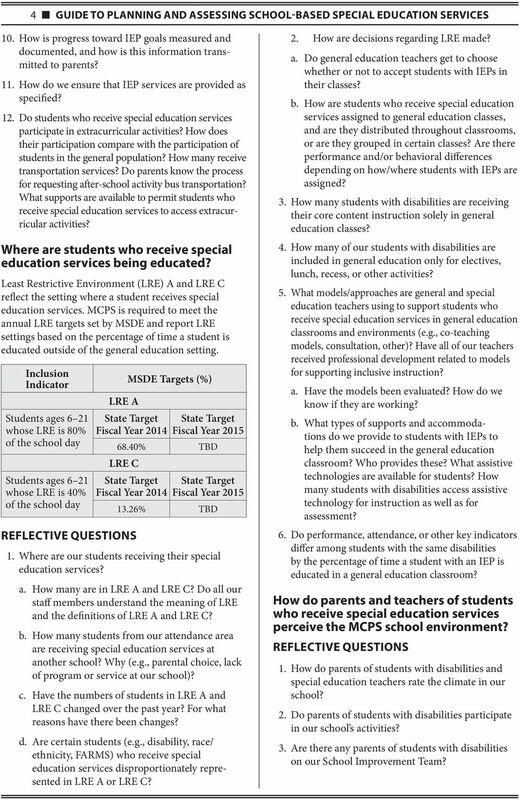 Least Restrictive Environment (LRE) A and LRE C reflect the setting where a student receives special education services. MCPS is required to meet the annual LRE targets set by MSDE and report LRE settings based on the percentage of time a student is educated outside of the general education setting. Inclusion Indicator Students ages 6 21 whose LRE is 80% of the school day Students ages 6 21 whose LRE is 40% of the school day LRE A MSDE Targets (%) Fiscal Year 2014 Fiscal Year % TBD LRE C Fiscal Year 2014 Fiscal Year % TBD 1. Where are our students receiving their special a. How many are in LRE A and LRE C? Do all our staff members understand the meaning of LRE and the definitions of LRE A and LRE C? b. How many students from our attendance area are receiving special education services at another Why (e.g., parental choice, lack of program or service at our school)? c. Have the numbers of students in LRE A and LRE C changed over the past year? For what reasons have there been changes? d. Are certain students (e.g., disability, race/ ethnicity, FARMS) who receive special education services disproportionately represented in LRE A or LRE C? 2. How are decisions regarding LRE made? a. Do general education teachers get to choose whether or not to accept students with IEPs in their classes? b. How are students who receive special education services assigned to general education classes, and are they distributed throughout classrooms, or are they grouped in certain classes? Are there performance and/or behavioral differences depending on how/where students with IEPs are assigned? 3. How many students with disabilities are receiving their core content instruction solely in general education classes? 4. How many of our students with disabilities are included in general education only for electives, lunch, recess, or other activities? 5. What models/approaches are general and special education teachers using to support students who receive special education services in general education classrooms and environments (e.g., co-teaching models, consultation, other)? Have all of our teachers received professional development related to models for supporting inclusive instruction? a. Have the models been evaluated? How do we know if they are working? b. What types of supports and accommodations do we provide to students with IEPs to help them succeed in the general education classroom? Who provides these? What assistive technologies are available for students? How many students with disabilities access assistive technology for instruction as well as for assessment? 6. Do performance, attendance, or other key indicators differ among students with the same disabilities by the percentage of time a student with an IEP is educated in a general education classroom? How do parents and teachers of students who receive special education services perceive the MCPS school environment? 1. How do parents of students with disabilities and special education teachers rate the climate in our 2. Do parents of students with disabilities participate in our school s activities? 3. Are there any parents of students with disabilities on our School Improvement Team? 5 GUIDE TO PLANNING AND ASSESSING SCHOOL-BASED SPECIAL EDUCATION SERVICES 5 4. Is there a process for parents of students with disabilities to communicate with classroom teachers? Is the process the same as for general education teachers? Is the process working? What evidence do we have that it is working? 5. How many complaints, have we had from parents of students who receive special education services in our Is there a recurring issue? 6. Does our school have a disabilities chairperson of a PTA special needs committee? How are parents informed about who the chairperson is, and is the special needs committee active within our school s parent-teacher association (PTA)? 7. Have parents of students with disabilities responded to the parent satisfaction survey for our school differently from general education parents? If so, in what ways and why? 8. Is there a schoolwide homework policy in our Is it different for students who receive special Are students with disabilities assigned class work that they miss due to pull-out services as homework? What supports are available to help students with disabilities and their families complete homework assignments? 9. Are the modifications and accommodations for homework for students who receive special education services known to the general education teachers? To the parents? 10. Are specialized homework supports available for students who receive special education services in our 11. In our school, do all teachers share responsibility for the performance of students who receive special 12. What training or supports are given to our teachers who provide services to students with disabilities? What follow-up has been put in place to monitor the implementation and/or effectiveness for students? What mental health and behavioral interventions are used in our 1. What are the suspension and expulsion rates for students with disabilities in our a. What are the reasons for suspensions? b. Has the number increased/decreased over the past school year? Why? c. When considering a behavior infraction of a student with a disability, do we investigate whether the student has had appropriate supports and accommodations and whether the student s IEP is being fully implemented? 2. Does our school have a schoolwide plan for dealing with disruptive students? Does our school have a plan based on positive behavior supports? 3. Does our school have a crisis intervention plan for students who are in behavioral/emotional crisis? Is this plan based on positive behavior supports? 4. Are physical restraints used in our If so, under what circumstances? How is their use documented? How are parents informed? 5. Have our staff members been trained in physical restraint techniques? 6. Do we use in-school suspension? a. How often has it been used? b. Are records maintained? 7. Do any of our students have functional behavioral 8. Do any of our students have Behavioral Intervention Plans (Behavioral Management Plans)? Do we know whether these plans are being implemented properly? Is data regularly collected and reviewed? As a result, are plans adjusted? 9. Do we have or use in-school intervention in our building? How often do we utilize alternatives to suspension? 10. Do we have procedures for using in-school intervention? 11. How do we ensure appropriate services are provided during an in-school intervention? 12. Do we keep logs documenting who uses in-school intervention? 13. Do some teachers use in-school intervention or in-school suspension more than others? 14. Who reviews the serious incident reports for our a. What actions are taken? b. Do we keep records on the students who have been involved in serious incidents? 15. Have our staff members been trained in positive behavior-intervention strategies? What is Special about Special Education? Who Benefits from Special Education? 5-6--7- Wm Fremd High Township HSD Palatine, ILLINOIS GRADES : 9 Wm Fremd High ILLINOIS SCHOOL REPORT CARD and federal laws require public school districts to release report cards to the public each year. Section D: Support Staff and Service Student Services Organization and Interdisciplinary Teams D. 1 Autism Services D. 3 Care and Treatment Program Coordinator D. 5 Children s Treatment Network/YRDSB D.